I have some fantastic new quick and easy recipes to make your weekend dinners a snap to prepare. All of these recipes (listed below) are bursting with flavor and can be made in about 30 minutes. First I have a secret recipe for a low carb garlic shrimp dish. For a complete meal serve your garlic shrimp with a fresh salad on the side. This recipe is only one of the healthy low carb recipes featured in the “Living Low Carb” cookbook. This cookbook contains over 100 great-tasting low carb recipes that are guaranteed to satisfy your appetite. Or if you’d like to get this title alone, go here. Heat the oil in a heavy-bottom skillet over low heat. Add the garlic and chilies and cook, stirring occasionally, for 1-2 minutes, or until softened but not colored. Add the shrimp and stir-fry for 2-3 minutes, or until heated through and coated in the oil and garlic mixture. Turn off the heat and add the chopped parsley, stirring well to mix. Season to taste with salt and pepper. 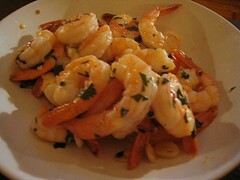 Divide the shrimp and garlic-flavored oil between warmed serving dishes. Garnish with lemon wedges and serve.